Halley's Comet passed perihelion in its twenty-fourth known passage, as calculated from records including ones by Chinese astronomers. James Watt (19 January 1736 - 25 August 1819) was a Scottish mathematician and engineer whose improvements to the steam engine were a key stage in the Industrial Revolution. He was born in Greenock, Scotland, and lived and worked in Birmingham, England. He was a key member of the Lunar Society. Many of his papers are now kept in the Birmingham Central Library. Sir William Herschel (15 November 1738 - 25 August 1822) was a German-born British astronomer and composer who became famous for discovering the planet Uranus, and made many other astronomical discoveries. After starting as a musician, his interest in astronomy grew stronger after 1773, and he built some telescopes and made the acquaintance of Nevil Maskelyne. He observed the Moon, measuring the heights of Lunar mountains, and also worked on a catalog of double stars. The turning point in his life was 13 March 1781, while residing at 19 New King Street, Bath, when he discovered Uranus. This made him famous and enabled him to turn to astronomy full-time. Naming the new planet Georgium Sidus in honour of King George III also brought him favour (although the name didn't stick). That same year, Herschel was awarded the Copley Medal and was elected a Fellow of the Royal Society. In 1782, he was appointed "The King's Astronomer" and he and his sister Caroline subsequently moved to Datchet (then in Buckinghamshire but now in Berkshire) on 1 August 1782. He continued his work as a telescope maker as well, selling a number of them to other astronomers. He also discovered infrared radiation (c.1800) by passing sunlight through a prism and holding a thermometer just beyond the red end of the visible spectrum. The thermometer indicated a temperature increase and this led to Herschel's conclusion that there must be an invisible form of energy. In his later career, Herschel discovered two satellites of Saturn, Mimas and Enceladus; and two satellites of Uranus, Titania and Oberon. He did not give the latter satellites their names; rather, they were named by his son John in 1847 and 1852, respectively, well after his death. In addition to working on creating an extensive catalog of nebulae, he also continued to study double stars. He was the first to discover that most double stars are not mere optical doubles as had been supposed previously, but are true binary stars. From studying the proper motion of stars, he was the first to realize that the solar system is moving through space, and he determined the approximate direction of that movement. He also studied the structure of the Milky Way and concluded that it was in the shape of a disk. Herschel coined the word "asteroid". Herschel was also known for an eccentric theory that the Sun was inhabited. R. Luther discovered asteroid #84 Klio. Michael Faraday (22 September 1791 - 25 August 1867) was a British scientist (physicist and chemist) who made significant contributions in the study of electromagnetism and electrochemistry. His experiments also established the relationship between electricity, magnetism and light. Among his inventions are the homopolar motor, dynamo (a predecessor of modern generators), and the first form of the Bunsen burner. C. H. F. Peters discovered asteroid #287 Nephthys. A. Charlois discovered asteroid #426 Hippo. Died, Antoine Henri Becquerel, Nobel 1903 "in recognition of the extraordinary services he has rendered by his discovery of spontaneous radioactivity"
J. Palisa discovered asteroid #688 Melanie. The first well-documented case of a pilot successfully correcting and surviving a spin occurred when Royal Flying Corps Lieutenant Wilfred Parke turned his rudder against the direction of the spin. G. Neujmin discovered asteroids #829 Academia and #830 Petropolitana. The first scheduled passenger service by airplane was inaugurated, between Paris and London. S. Belyavsk and N. Ivanov discovered asteroid #1086 Nata. E. Delporte discovered asteroid #1168 Brandia. S. Arend discovered asteroids #1281 Jeanne, #1286 Banachiewicza and #1287 Lorcia; G. Neujmin discovered asteroid #1331 Solvejg; and K. Reinmuth discovered asteroid #2676 Aarhus and #2943. The first use of a partial pressure suit to save a pilot's life during high altitude flight occurred during XS-1 rocket plane Flight 124 when the X-1 lost cockpit pressurization at about 21000 m. Pilot Frank Everest made a safe emergency descent. NASA launched Explorer 13 (S 55A), designed in part to measure the effects of micrometeoroids on spaceflight, which ended up in a useless orbit and failed to meet expectations, thereby necessitating further tests in this area. USSR launched Sputnik 19 (also called Alpha Pi 1, originally called Sputnik 23 in the US Naval Space Command Satellite Situation Summary), intended to travel to Venus or Mars (reports vary), but which failed to escape Earth orbit. Sputnik 19, launched 25 August 1962, was a Venera-type spacecraft intended to make a landing on Venus. (Some reports indicate the target was Mars.) The SL-6/A-2-e launcher put the spacecraft into Earth orbit, but the escape stage failed (the motor burned for only 45 seconds of the planned 240 seconds) and the probe remained in geocentric orbit for three days, until the orbit decayed on August 28 and it re-entered Earth's atmosphere. NASA launched Explorer 20 (IE-A) into orbit from Vandenburg, California, for ionospheric research. NASA launched the OSO C solar observatory from Cape Canaveral, Florida, but the satellite failed to reach orbit because of a premature third stage ignition failure. NASA and the USAF launched X-15A MIT Scan, Stability test mission # 144 in which Milt Thompson reached a maximum speed of 5800 kph (Mach 5.11), and achieved a maximum altitude of 65.258 km. Z. Pereyra discovered asteroid #1769 Carlostorres. NASA launched Apollo-Saturn 202, a successful flight test of a production Apollo Block I type spacecraft using a Saturn IB launch vehicle, to demonstrate structural integrity and compatibility, and for evaluation of heatshield performance. 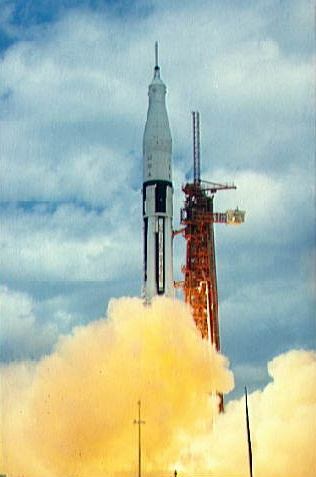 The Apollo-Saturn 202 (AS-202) mission, launched 25 August 1966, was an unmanned suborbital flight to test the Saturn 1B launch vehicle and the Apollo Command and Service Modules. The objectives of the flight were to verify the structural integrity, launch loads, stage separation, and operation of subsystems of the Saturn 1B, and evaluate the Apollo spacecraft separations, emergency detection system, subsystems, heatshield at high re-entry velocity, and mission support facilities. All objectives were achieved. The Saturn 1B and its payload consisting of the Apollo CSM-011 were launched from complex 34 of the eastern test range at Cape Canaveral. After both stages of the Saturn 1B completed their burns and separated, the service module propulsion engine burned for 3 minutes, 35 seconds to boost the spacecraft to a peak altitude of 1,128.6 km. The rapid restart capability of the service module's engines was tested by firing three more times, the last separating the service module from the command module. The firings also accelerated the command module re-entry to greater than 8900 meters/sec (32,000 km/hr). Maximum temperature of the spacecraft exterior was calculated at about 1500 deg. C, temperature inside the cabin was 21 deg. C (70 F). The main parachutes deployed at 7250 meters altitude and the spacecraft splashed down at 18:49 UT, 93 minutes after liftoff. Splashdown occurred in the Pacific Ocean at 16.11 N, 168.97 E, roughly 800 km SE of Wake Island and 370 km from target. The capsule was recovered by the aircraft carrier USS Hornet at 03:17 UT on 26 August. NASA/USAF launched X-15A HS/MuMet/Gas Technology/Meteor/Aeronomy mission # 169 in which John McKay flew 5702 kph (Mach 5.11), reached 78.486 km, and collected micrometeorites and extraterrestrial dust, a failure due to a re-entry inertial malfunction. NASA and the USAF launched X-15A Guid/HT/BLN test mission # 187 in which Michael Adams reached a maximum speed of 5013 kph (Mach 4.63), and a maximum altitude of 25.725 km. Harvard College discovered asteroid #2221 Chilton. The Italian experimental spin stabilized commsat SIRIO-A was launched from Cape Canaveral and positioned in geosynchronous orbit over the Atlantic at 15 deg W 1977-1981; at 25 deg W 1981-1983; and over the Indian Ocean 65 deg E 1983-1985. 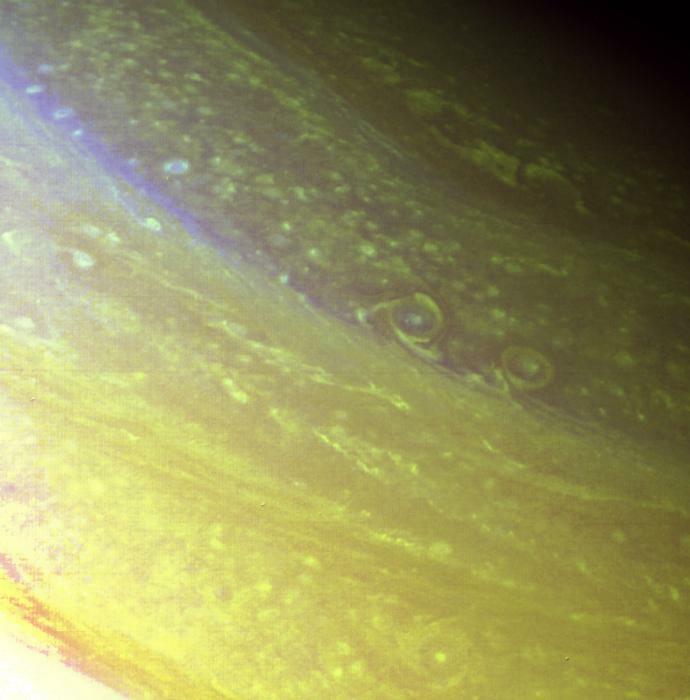 NASA's Voyager 2 flew past Saturn at a distance of 63,000 miles (100,000 km). During the encounter, it also photographed at least 7 of Saturn's small satellites. The Voyager 2 spacecraft, originally planned as Mariner 12 of the Mariner program, was launched on 20 August 1977 on a mission to explore the outer planets of the solar system. It is identical to its sister Voyager program craft, Voyager 1. Voyager 2 followed a somewhat different trajectory during its Saturn encounter, however, bypassing a close encounter with Titan in favor of taking advantage of a gravitational slingshot to travel on to Uranus and Neptune. It became the first probe to visit those two planets. Voyager 2 was launched from Cape Canaveral, Florida aboard a Titan-Centaur rocket. The closest approach to Jupiter occurred on 9 July 1979. On 25 August 1981, Voyager 2 flew past Saturn at a distance of 63,000 miles (100,000 km), and it took pictures of Saturn's moon Titan the following day, 26 August. Its closest approach to Uranus was on 24 January 1986, and its closest approach to Neptune occurred on 25 August 1989, after a 12 year, 4 billion mile journey, when it flew over the planet's cloud tops and those of its moon Triton, sending back photographs of 'swamps' from a distance of 5000 km. Voyager 2 imagery returned on 22 August 1989 confirmed the rings around Neptune are complete, although they are much more faint than those of Saturn. As of 24 August 2003, Voyager 2 was at a distance of 10.6 billion kilometers (71 AU) and was escaping the solar system, diving below the ecliptic plane at an angle of about 48 degrees and at a speed of about 3.3 AU per year (ca. 15 km/s, 470 million kilometers (about 290 million miles) a year). On 8 July 2018 it was more than 17.65 billion km (10.97 billion miles, nearly 118 AU) from the Sun. (See Where Are The Voyagers Now? for distance, speed, and other interesting information.) It will be approximately 40,000 years before Voyager 2 approaches another planetary system. Voyager 2 is expected to keep transmitting into the 2030s. Voyager 2 carries with it a golden record (Voyager Golden Record) that contains pictures and sounds of Earth, along with symbolic directions for playing the record. The contents of this record were selected by a committee chaired by Carl Sagan. USSR launched the Raduga 13 communications satellite from Baikonur, which was positioned in geosynchronous orbit at 45 deg E.
NASA's Challenger Center opened its classroom doors in Houston, Texas. The US Navy launched the Transit-O 25 and Transit-O 31 navigation satellites from Vandenburg, California. 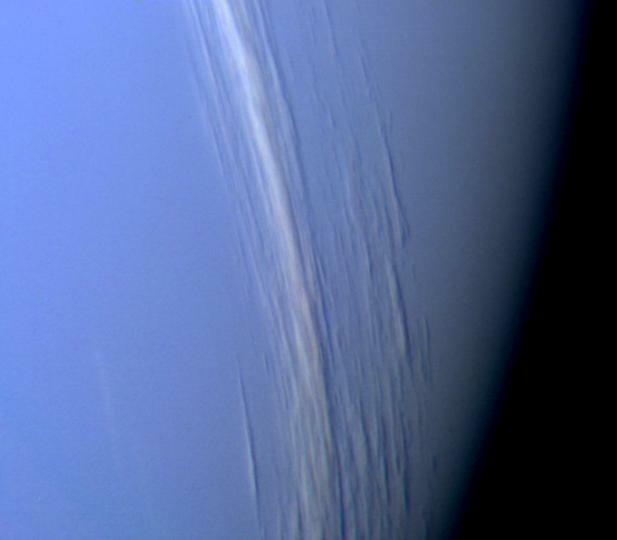 NASA's Voyager 2 was the first spacecraft to fly by Neptune, passing within 5,000 km of the cloud tops. Japan launched the Yuri 3B (BS-3B, Broadcasting Satellite-3B) TV communications satellite from Tanegashima, which was positioned in geosynchronous orbit at 110 deg E in 1991-1999. S. Otomo discovered asteroid #6975. Russia launched the Progress M-24 unmanned resupply vessel to Mir from Baikonur. The unmanned resupply vessel Progress M-24 was launched 25 August 1994. It failed to dock automatically with Mir on 27 August. 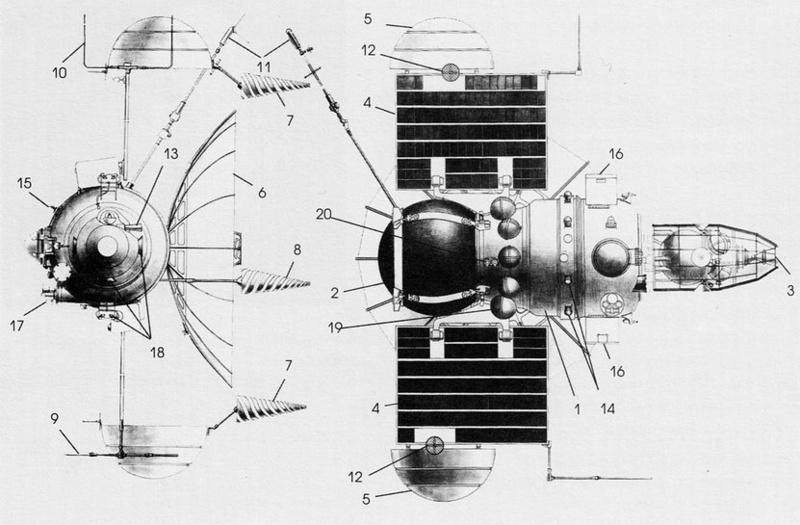 A second automatic docking attempt on 30 August also failed, and the Progress collided with the Kvant module. A third and final attempt, manually controlled by Mir commander Yuriy Malenchenko, was successful on 2 September at 13:30:28 GMT. Mir commander Malenchenko and flight engineer Talgat Musabaev made a spacewalk on 9 September to inspect the damage to the Kvant module made when the Progress collided with Kvant. Progress M-24 undocked on 4 October 1994 18:55:52 GMT, leaving the rear docking port free for Soyuz TM-20. It was destroyed in reentry over the Pacific at 38.4 deg S, 137.4 deg W,on 4 October 1994 22:43:00 GMT. Total free-flight time 8.12 days. Total docked time 32.23 days. NASA launched the ACE (Advanced Composition Explorer, Explorer 71) spacecraft, built by the Applied Physics Lab at Johns Hopkins University, which was placed at the Earth-Sun L1 point. 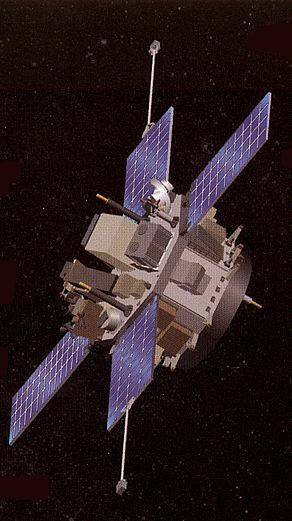 The objective of the Advanced Composition Explorer (ACE), launched 25 August 1997, was to collect observations of particles of solar, interplanetary, interstellar, and galactic origins, spanning the energy range from that of KeV solar wind ions to galactic cosmic ray nuclei up to 600 MeV/nucleon. Definitive studies were to be made of the abundances of essentially all isotopes from H to Zn (Z = 1-30), with exploratory isotope studies extending to Zr (Z = 40). The ACE payload included six high resolution spectrometers, each designed to provide the optimum charge, mass, or charge-state resolution in its particular energy range. Each spectrometer had a geometry factor optimized for the expected flux levels, so as to provide a collecting power greater by a factor of 10-1000 times that of previous or planned experiments. The payload also included three additional instruments of standard design to monitor energetic electrons, H and He ions, and a magnetometer. The ACE spacecraft was based on the design of the Charge Composition Explorer, built at JHU/APL for the Active Magnetospheric Particle Tracer Explorer (AMPTE) program. The spacecraft spin axis was pointed towards the Sun to within +/- 20 degrees, and it occupied a halo orbit about the L1 Earth-Sun libration point. Powered by solar cells, the spacecraft had a design life of at least five years, and it returned data in daily tape recorder dumps, received through NASA JPL's Deep Space Network and initially processed at NASA-GSFC. The average data telemetry rate was 6.7 Kbs. Soyuz TM-27 undocked from Mir at 02:05 GMT, with Musabayev, Budarin and Baturin aboard. The cosmonauts then landed near Arkalyk in Kazakstan. The Singapore-Taiwan-1 (ST-1) Matra Marconi Space Eurostar 2000 class satellite was launched from Kourou to provide communications for Singapore Telecom and Chunghwa Telecom of Taiwan, and positioned in geosynchronous orbit at 88 deg E 1998-1999. NASA launched the Spitzer Space Telescope (formerly SIRTF, the Space Infrared Telescope Facility), the final element in NASA's Great Observatories Program. The Spitzer Space Telescope (formerly SIRTF, the Space Infrared Telescope Facility) is a 0.85-meter telescope with three cryogenically cooled instruments, operating in the 3 - 180 micron range. The observatory is the final element in NASA's Great Observatories Program. The science capabilities include imaging/photometry at 3 - 180 microns, spectroscopy at 5 - 40 microns, and spectrophotometry at 50 - 100 microns. Spitzer will study a wide variety of astronomical phenomena, extending from our Solar System to the distant reaches of the early Universe. SIRTF was launched by the second Delta II Heavy on 25 August 2003. The second stage entered a 166 x 167 km x 31.5 deg Earth parking orbit, and after about 33 minutes of coast, passing south of Madagascar, restarted at 0613 UTC to enter a hyperbolic orbit with a perigee of 170 km, an eccentricity of 1.0061, and a velocity of 11.05 km/s. This placed it in a solar orbit of 0.996 x 1.019 AU x 1.14 deg with a year about 4 days longer than Earth's: Spitzer has an Earth-trailing heliocentric orbit. The spacecraft consists of an octagonal bus structure, and a solar array to power the science instruments. The pointing control subsystem employs a celestial-inertial, three-axis stabilized control system. The Spitzer telescope is a lightweight reflector of Ritchey-Chretien design. The telescope has an 85 cm diameter aperture. The instruments selected include: 1) a four-channel infrared array camera imaging at 3.6, 4.5, 5.8, and 8 microns; 2) an imaging photometer, with three detector arrays imaging at 24, 70, and 160 microns (one array will also take low-resolution spectra at 50 - 100 microns); 3) a spectrograph providing high- and low-resolution spectroscopy at mid-infrared wavelengths (5 - 40 microns). Spitzer depleted its cryogenic cooling supplies on 15 May 2009. As of 25 August 2015, Spitzer's "warm" mission with instruments at 28K is continuing as investigators from around the world use the facility to study the cosmos. The 3.6 and 4.5 micron cameras are still working at peak performance in the near- to mid-infrared portion of the spectrum. Astronomers use the Infrared Array Camera (IRAC) to study everything from comets and asteroids in our solar system, planets orbiting other stars, to the most distant galaxies in the Universe. Neil Alden Armstrong (5 August 1930 - 25 August 2012) was the first human in known recorded history to walk on the surface of another planetary body, stepping onto the surface of the Moon at 0256 GMT on 21 July 1969 during the Apollo 11 mission. He was also a member of the crew of the first spaceship to dock in space (Gemini 8), and a test pilot with an extensive record before being selected as an astronaut in 1962. NASA's Voyager 1 probe crossed the heliopause, the boundary between the end of the Sun's magnetic influence and the beginning of interstellar space.